UIlrich Ostergaard crashes out of the Ipswich meeting. Panthers owner Ged Rathbone admits he feared Ulrich Ostergaard’s season would be over in the immediate aftermath of a frightening Sunday smash. 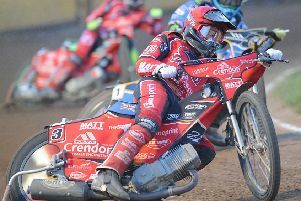 The Danish racer slammed into the fence after colliding with rival rider Nico Covatti during the seventh heat of the city club’s SGB Championship Shield success against Ipswich at the East of England Arena. The meeting was held up for almost an hour as he was treated before being taken to Peterborough City Hospital where a CT scan revealed no lasting damage. Ostergaard is ruled out of tonight’s SGB Championship trip to Redcar due to concussion and whiplash, but he’s expected to be back in action when Lakeside visit Alwalton on June 29. Rathbone said: “Ulrich knows only too well that he has had a hugely lucky escape. “We’ll take being without him for one meeting as he could so easily have been out for the season. I’m amazed – and also relieved - he has not done any lasting damage. “He is still suffering a lot of pain in the neck – which is only to be expected after the sort of impact he had – and is struggling a bit with the concussion. Panthers tried to secure the services of a guest to replace Ostergaard at Redcar but with five other SGB Championship sides and two SGB Premiership teams in action it proved difficult. So they have decided to operate the rider replacement facility with all other members of the team – including number one Scott Nicholls – able to take an extra outing. Redcar are without their top two riders tonight. Number one Ben Barker, who helped Panthers lift the KO Cup last season as a guest for the second leg of the final, is out injured while recent signing Thomas Jorgensen is on duty for his Premiership club King’s Lynn. The Bears have turned to Berwick rider Aaron Summers and Scunthorpe man Josh Auty as guests. REDCAR: 1 Aaron Summers (guest), 2 Mikkel B. Andersen, 3 Dimitri Berge, 4 Jonas B. Andersen, 5 Josh Auty (guest), 6 Nathan Greaves, 7 Jordan Stewart. PANTHERS: 1 Scott Nicholls, 2 Ellis Perks, 3 Bradley Wilson-Dean, 4 Michael Palm Toft, 5 Rider replacement or guest for Ulrich Ostergaard, 6 Simon Lambert, 7 Tom Bacon.